Big wave surfer world record holder Shawn Dollar said he was lucky to be alive after breaking his neck in four places surfing in California. The 34-year-old American also incurred head trauma and suffered concussion when the accident happened off the state's Central Coast. Dollar rode a 61-foot wave at the Cortes Bank, near San Diego in 2012, to set a new world record. "I'm so thankful I'm alive and present today," Dollar said. "I'm thankful to learn that even with these severe injuries I will make a full recovery." This is extreme surfing. The surfers paddle, or are towed by a jet ski, into a wave measuring more than 20ft high. American Garrett McNamara, 48, holds the overall current world record when he was towed into and rode a 78-foot wave at Nazare, Portugal in 2011. 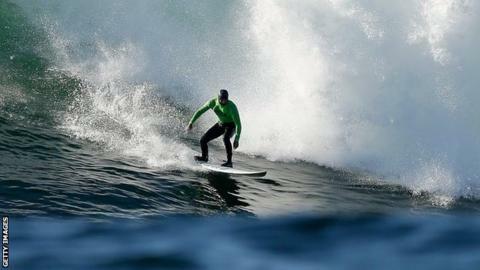 Dollar, meanwhile, holds the 'paddle-in' world record for his 2012 Cortes Bank exploits. Briton Andrew Cotton is one of the best big wave surfers in the world. The 35-year-old from north Devon rode a wave measuring 60ft off the coast of Portugal in 2014.